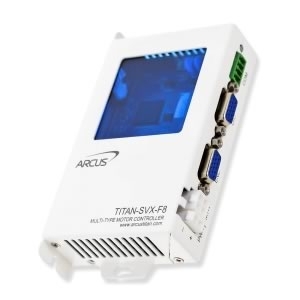 The Titan-SVX from Arcus is the first universal, intelligent single-axis servo motor driver and controller available which can learn patterns of motion and anomalies in real time. The “2nd Sight Technology” (patent pending) is unique in having a built-in motion pattern learning and monitoring technology with motion healthy trend and fault prediction capability. This new product is packed with innovative features and represents a real breakthrough in advanced intelligent motor drivers which are able to fulfil the aims and objectives on Industry 4.0. Real-time closed loop servo driver controller for stepper, BLDC, linear and voice coil motors. Easy to use software with intuitive text-based multi-thread stand-alone programming together with advanced graphing and probing functions. Built-in 2nd Sight Technology which is a patent-pending multi-dimensional motion state and pattern recognition algorithm with edge data analytics. The Arcus Titan-SVX is available from LG Motion in the UK, so if you’d like more details, please get in touch.